The Republican National Committee votes to retain its chairman, whose plan to renew the party is… cheating. The Republican National Committee has retained Reince Priebus as party chairman, keeping the failed leader in a position previously occupied by Mark Hanna, Lee Atwater and Haley Barbour. Even as he accepted his new term, Priebus acknowledged that he and his minions have led their party far from the American mainstream. “We have to build better relationships in minority communities, urban centers and college towns,” he admitted in his acceptence speech. But those are just carefully chosen words for public consumption. Priebus was not reelected to build a multiracial, multiethnic party that embraces diversity and seeks to deliver a message of opportunity for all. The whole point of his chairmanship has been to combat the politics of inclusion that Republicans decry Barack Obama for practicing. That has placed the once honorable Republican Party on the wrong side of history, and of American progress. Priebus has seen the numbers. He understands the demographics. He knows the GOP, as it is currently organized and focused, is unlikely to win the “trust” he spoke of. Indeed, he is so sure that the party will fail to do so that he has devoted himself and his party to advancing restrictive “Voter ID” laws, placing limits on early voting and Election Day registration and, most recently, restructuring the Electoral College so that the party can remain competitive even if it lacks popular appeal. It is that scheming—not a promise of Republican renewal—that explains why Priebus retained the chairmanship in spite of the electoral failures that occurred on his watch. 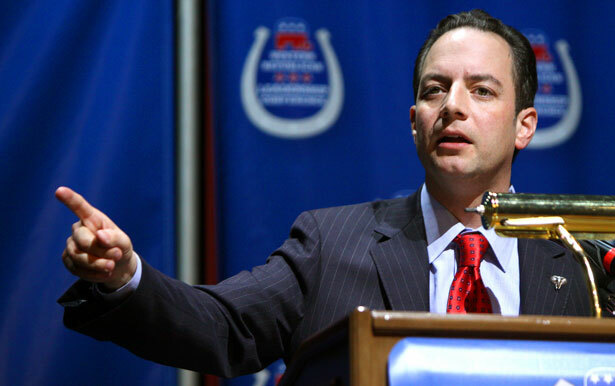 RNC members certainly did not retain Priebus because of his track record. The RNC’s top priority in 2012 was beating Barack Obama. Yet, they lost the popular vote by 5 million ballots, lost the Electoral College 332 to 206, lost two seats in the US Senate and fell 1.4 behind in the nationwide vote for the US House. They also lost seven of eleven gubernatorial races. Only gerrymandering of congressional and legislative district lines prevented a complete wipeout for the Grand Old Party. Because the former chairman of the Republican Party of Wisconsin, and veteran party fixer, has a plan for a party on a losing streak. Priebus wants to make it possible for losers to “win.” To that end, he’s urging Republican governors and legislators to change the rules for distribution of Electoral College votes so that a Republican presidential candidate might lose a state and still gain most of its electoral votes. Responsible Republicans in key states have objected to the chairman’s scheming to have those states end the practice of awarding electoral votes to the winner and instead allot them based on the results from gerrymandered congressional districts. Unfortunately for the Republicans who would like their party to stand for something more noble than gaming the system, Priebus is what happens when the party of Abraham Lincoln, Teddy Roosevelt and Dwight Eisenhower loses its way—and its self respect. Read John Nichols’s proposals for fighting back against the GOP’s voter exclusion schemes.